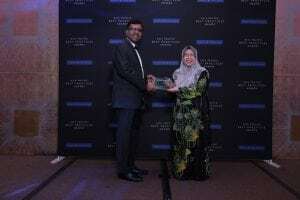 Chemical Company of Malaysia Berhad’s (CCM) subsidiary, CCM Duopharma Biotech Berhad (CCMD), was awarded the Halal Pharmaceutical Company of The Year for its Prescription Pharmaceuticals by Frost & Sullivan at its 13th Annual Malaysia Excellence Awards banquet, held at the Hilton Kuala Lumpur recently. This is the first time that the Halal category had been included to this list of awards. The award was received by CCM’s Senior Board Member, Tan Sri Siti Sa’diah binti Sh. Bakir from Mr Ravi K, Senior Vice President of Frost & Sullivan (photo). The Frost & Sullivan Malaysia Excellence Awards aims to recognize Malaysian companies for demonstrating outstanding achievement and superior performance in areas such as leadership, technological innovation, customer service and strategic product development. Its industry analysts compare market participants and measure performance through in-depth interviews, analysis and extensive secondary research in order to identify best practices. CCM is the first pharmaceutical manufacturer to receive the Halal Pharmaceuticals Certification based on the world’s first Halal Pharmaceuticals Standard: MS2424:2012 ‘Halal Pharmaceuticals – General Guidelines’, and listed in the Malaysia Book of Records in 2013 for its vitamins, health supplements and over-the-counter (OTC) medicines. Earlier this year, CCM, had again, together with JAKIM chartered another milestone in the Global Halal industry by being the first to have the controlled/prescriptive medicines (ethical products) being Halal certified based on the MS2424.